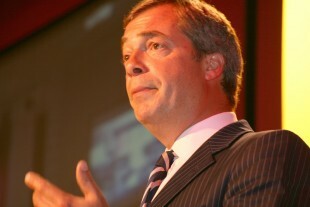 With only two weeks to go until the general election, Survation has conducted another poll in the South Thanet constituency where Nigel Farage is hoping to win a seat. The results show that Farage retains a 9 point lead over Craig Mackinlay of the Conservatives just 14 days before polling day. The poll also measured the activity of the three main campaigns, showing that UKIP has a significant advantage in the area on all contact rates, particularly phone and door knocks from activists. While most constituents have been leafleted by the three main parties, under 10% have received a phone call or met the candidate from Labour or the Conservatives, whilst nearer 20% have done so from UKIP. 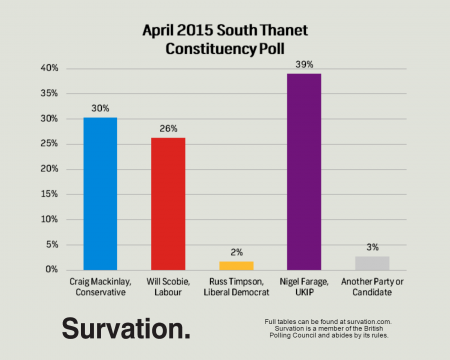 UKIP door knock rates are also around double that of their main rivals in South Thanet. Survation on behalf of Alan Bown interviewed 1,057 residents of the South Thanet constituency on 22 April 2015 about the upcoming general election. Full data tables can be found here.